How Were Dates Calculated in Ancient India before the Widespread Awareness of Christianity? Firstly, the presumption that the moment a scholarly man with a mission of spreading love and peace descended upon the world, people just said “Hey, let’s reckon time based on the time before and after his birth!”, is fallacious. Jerusalem being predominantly Jewish, people used the same Hebrew calendar the Jews do to this day. Other surrounding regions used local calendars like the Egyptian or the Roman. The reign of the Roman king Diocletus who persecuted Christians was notable for the introduction of the Era of the Martyrs. This period was tracked by the Christian faithful, denoting the years since anti-Christian oppression started under him. And it was NOT until 525 AD that Dionysius decided he didn’t want to date years in the name of a man who had persecuted Christians. He came up with the brainwave to date the present year relative to the “Incarnation of Our Lord Jesus Christ”. It was also not until AD 900 that even Christian lands adopted this calendar fully and formally. Christianity came to India at about AD 52 with the believed arrivals of St. Thomas and Bartholomew in India’s Southern and Western coasts respectively. More priests, churches and communities followed in the next couple of centuries, meaning that Christianity gained enough of a foothold in India long before the Christian AD calendar era was even invented! Ok so what were Indians using? While local kingdoms dated their years and coins based on the regnal year of the reigning king (which was also the basis for the 15-year agricultural tax cycle and 10-year census), the Brahmins who needed it to plan for rituals, and astrologers didn’t bother with such trifles. Theirs was a truly grand scale. It is a system we use, to this day, while initiating any religious activity. So what IS this? Let’s break it down. Of the 100 year life of Lord Brahma (covering creation and destruction of the Universe), fifty years have elapsed, and we are in the second half, denoted by Dwiteeya Parardhe, of the first day (Aadya Brahmane) in the 51st 360-day year of Lord Brahma. The Vedic concept is that over the cycle of one Maha kalpa (100 years of Brahma ~ around 311 trillion years) the universe expands, and then contracts, to a “Big Crunch”, the antithesis of a Big Bang. We have reached the maximum expansion phase, and contraction has begun. This is corroborated by the “modern” science of NASA. We are in the first day, Shweta Varaha Kalpa in the 51st year of Lord Brahma. One Kalpa is equal to 4,320,000,000 years. Two of them constitute one “day” of Brahma, totalling 8.64 billion years, roughly corresponding to what is predicted to be the lifespan of the Earth. In the Shweta Varaha Kalpa after passing through 6 Manvantaras (out of 14 we are currently in the 7th Manvantara, Vaivaswata Manvantara, each of which is around 306,720,000 years long). Thus ends the description of the Age (the huge measure of time elapsed that is likely to remain constant over a normal human lifetime, and we move on to the other aspects). Meror Dakshina bhage (alternatively Dakshine parsve) – To the south of Meru Parvata which is in the centre of Jambu Dweepa. Bhaaratavarshe: There are nine Varshas in this Universe out of which we are in the Bhaaratavarsha. Bharatakhande: In the land ruled by King Bharata – (the present India). Mama Swagruhe (own house) or Sobhana Gruhe (staying in a rented house) – This may change depending on the place where one is performing the karma. Devata Sannidhau: In the presence of the God dwelling in my house. Asmin Vartamanena: At the present time. Vyavahaarike – Chandraamanena: As per the present calendar that is in vogue. Hevilambi Samvastare: There are sixty named years as per the Lunar Calendar cycle, from Prabhava to Akshaya. We are in Hevilambi, number 31, right now. The reason there are sixty in a cycle, is that the planet Jupiter or Brhaspati takes 12 years of going around the sun to come to the exact same spot. Shani or Saturn has a five year cycle. Therefore, after sixty years, the Earth, Jupiter and Saturn would be exactly where they were, a sort of “reunion”. Western Zodiac places emphasis on a “Jupiter Return”. The Vedic practice commemorates a joint “Jupiter and Saturn Return”, which is what the shashtiabdapoorthi is. Aayane: The year is divided into two based on the transit of Sun into Makara rashi, Uttarayana (Summer Solstice around January 15) and Karkataka rashi, Dakshinayana (Winter Solstice around July 15). Maase: Each season comprises of two months which are named after the star falling on the full Moon day of the month. Tithi: Each paksha comprises of 15 tithis (days) out of which 14 thithis are ordinal numbers in Sanskrit, and the 15th one is either Pournima (full moon) or Amavasya(new moon). Nakshatre: There are twenty seven (27) stars in the almanac which are placed in 12 rashis or constellations of the zodiac. These stars cyclically repeat, from Ashwini to Revathi. 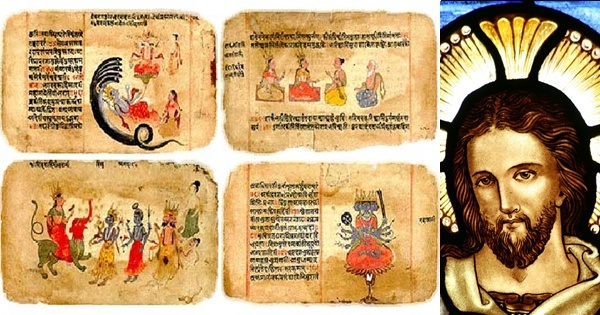 Yoge: There are 27 yogas in the almanac starting from Vishkumbha and ending with Vaidruthi. These yogas also get repeated cyclically. In practice the names of Yoga and Karana are not spelled out, just referred to as Shubha Yoge, and Shubha Karane. After all this, comes the specific invocation, or desire being prayed for. At at time so auspiciously ordained, undertake (miscellaneous) activity, do I. Quite extensive and long yes, but this is the fool proof way of measuring time, and happens to match with modern astronomical devices that have estimated the time since the last Big Bang, or the lifespan of the Earth! It is also absolute in the sense it need not be tied to any particular region, country or person, and is simply a record of time elapsed since time started, period. This post was first published in Quora by the author. Featured image courtesy: Simple Wikipedia and The Chakra News. Ram Narayan is a Transformation Manager, with a management degree in Human Resources. When not busy transforming company processes for the better, he spends time reading on Indian history and economics.